Children's Full Color Picture Book with Rhyming Verses - 48 Pages - Ages 5-10 - Fun - Whimsical - Eco-Friendly - Family-Friendly - Features cartoon characters including whales and dolphins. The book is also edutainment and includes educational facts and data relating to 5 different species of whales and dolphins. Make a splash as you dive into the enchanting and wonderful watery world of Whale Magic! 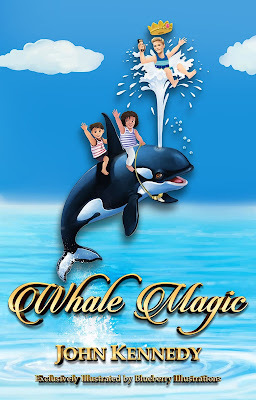 Whale Magic is a whale-of-an-adventure starring Prince Buoyant and Princess Eviana, The Prince and Princess of Whales, and a pod of royal whales each spouting their own special brand of magic. Wearing flowing robes, golden crowns and dazzling bejeweled tiaras, this fin-tastical pod of majestic whales are sure to have you hooked and cast their magic spell on you from the moment you open the book to the very last page. Managed By: The Prince of Whales Company. Mission Statement: The Prince of Whales Company and the author are committed to inspiring children from around the world to a deeper understanding and appreciation of our oceans, whales & dolphins, and the oneness of all life on this planet.